Museums that explore American Art and culture, often struggle with who’s stories get included and who’s do not. It is responsible and essential for Museums to include untold stories. These stories demand innovative and thought provoking displays that often require collaboration across fields. In this program, Mutope Johnson and Jon Prown will discuss their experiences with “The Dave Project” and how this has changed their curatorial thinking. For more than a decade the Chipstone Foundation has pursued topics related to African-American material culture, a topic often left out of American art museum exhibitions and decorative arts galleries. Many of the African-American artisans who created items in museum collections are anonymous. The Dave Project: Exploring African-American Material Culture reflects this institutional commitment. The title refers to the Foundation’s ongoing work on David Drake, an enslaved potter who inscribed his monumental jars with couplets. 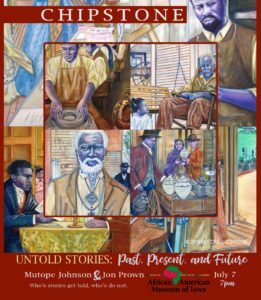 Research and exhibitions on Dave the Potter, Thomas Day, John Hemings, the enslaved makers of Southern face vessels, and other African-American artists and craftspeople reveal compelling American stories that belong in museums, schools, and in art historical and historical scholarship. The Chipstone Foundation studies and shares the objects they created, from face jugs to fine furniture, to tell their stories.